OK, I bet I asked about this one before. But lately, I have seen some answers. Have been having some luck. I don't have a team or a year. Back then, the Spanish league only allowed one foreign player but European competitions allowed two, so Real Madrid usually signed a second foreigner to play the European Cup (Clifford Luyk was the established star of the team; Wayne Brabender, also on the team, had received the Spanish nationality). In May 1970 it was reported that Jim Signorile, a 6-8 forward/center, would play the European Cup with Real Madrid for the forthcoming 1970-71 season. Even though Real Madrid did not make it to the finals, he played quite well and reportedly Real Madrid tried to get him naturalized, but nothing came out of it. According to that piece of news, the game took place on Saturday 05 February 1972, and Stade Clermontol beat Agen 141-68. It was the French Second Division. Thanks! Wow, two mysteries solved. I tried this archives. Hit and miss for me, I guess. is "Walter" on Madrid what they called Walter Szczerbiak? Yes, they even put "Walter" on the jersey. He always joked nobody could spell his name right. He never got the Spanish nationality, but he still spends much time in Spain. I met him at the presentation of a book on foreign players in the Spanish league. On the El Mundo Deportivo newspaper search engine/archive, how would I search for two terms at same time. Such as "47 puntos" and "baloncesto"
When I try that it either makes it into one exact phrase with the "and" r searches for the words "puntos" and "and"
Or it only looks for one date. Evidently if this is possible I haven't found it yet. Mostly what I did was look for a phrase they use on the basketball summary page (and for other sports), but this only worked so far (see my listings to see what I found), finding the highest for a given season. Mostly late 1970s, early 80s. When did the current league begin? I am afraid I can't get the hang of it either. I usually string a few terms hoping that the "relevance" setting will kick off, but mostly I have to sort them out myself. The current league as in ACB was established in 1983, for the 83-84 season. However, it carried over from the Liga Nacional (1957-1983). It was an organizational change as the new league was managed by the clubs themselves instead of the federation, but they maintained the same structure as before, same teams etc. Thanks for that one. I am looking for all games where a player scores 47 or higher. So far I mostly have found the season best game for a few years. I am surprised that Derrick Gervin doesn't find anything. Am I spelling his name wrong? That was in Cordoba, I think, Primera B (second division). He averaged over 46 ppg in 1987-88 for Cajasur. I don't think Primera B got much coverage, but I have a couple interviews with him from basketball magazines. He became some sort of cult hero as scored over 60 three times: 64 vs Ferris Lliria (110-98, 23 Jan 88), 63 vs Galeones de Vigo , 61 vs Badajoz. The funny thing was, Cajasur CÃ³rdoba had other foreign players. But they played a preseason game against a team of US players looking for contracts (named "Larios All Stars", as they were sponsored by Gin Larios) and Derrick Gervin scored 53 for Larios All-Stars (120-182, 26 Aug 87). Cajasol Cordoba fired one of its players and signed Gervin on the spot. He scored 48 in his first game vs Caja San Fernando Sevilla (a friendly). However, his utter lack of defense eventually doomed the team, which ended up being relegated despite his scoring. Bottom right corner, who is Green on Ten Sur? Bottom left: Who is Bower, Salesianos? Bottom right: Is this an exgibition game against US All-Stars? luckyshow wrote: Bottom right corner, who is Green on Ten Sur? Cajasur's Derrick Gavin had 54 pts. in same Jan. 2, 1988 game. Tensur's Ken Green also scored 54 pts in same Dec. 5, 1987 game. Cajasur's Derrick Gervin had 54 pts. in same 12/5/87 game. 47 pts. 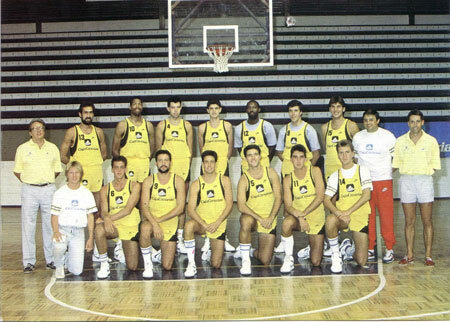 Eddy Lee Phillips, Canarias (Santa Cruz de Tenerife) (W 111-82) Nautico, 1/11/1986 Mike? Cajasur's Derrick Gervin scored 55 pts. in same 11/18/87 game. Cajasur's Derrick Gervin had 50 pts. in same 9/19/87 game. I will try and find out which Ken Green was at Ten Sur (there have been quite a few Ken Greens in Spain). So far I've found he was a 6-8 power forward who arrived from the "Atlanta franchise of the CBA". He was a 6-10 center born in Evansville in 1962, whose balding head hid a surprising athletic ability. He played for several seasons in Primera B. He graduated from the Southern Illinois University in 1984. Troy Bowers (Salesianos) was a 6-8 center, I found his name in the current staff of the Knicks of all places. He graduated from Boston College and had a long career in Europe. If you are asking about the game vs "P. Americas", it was a regular season game in Primera B (second division in Spain at the time). The team in Tenerife played under several names depending on sponsorts: Hovima, Ten Sur, Playa de las AmÃ©ricas. It was always the same team. There was a Eddy Phillips, or Eddie Lee Phillips. Or maybe Philips, as was also used frequently. Not quite as quirky as the habit of rarely using a full name! I am assuming they had problems with these names like Eddie and Phillips? Back row, the black player in a grey shirt. Great player, top notch scorer and very aggressive in defense, but he was just crazy. Teammates, coaches and rivals feared his outburst, until he left the country in October 1987 after a fight outside a disco which ended with Phillips firing several shots at the building. He was arrested alongside teammate Mike Harper (gun possession is a very serious crime in Spain, to say nothing of actually firing them), and they both left the team, the league and the country. Great player, left a mark in Canarias, but absolutely terrifying. He was bonkers. I had thought maybe this practice started with Spanish names which are sometimes very long and seem to have many first names. A Lopez-Rodriguez I found with a string of names in front. Also, how do Ken Green or Ken Perry have hard first names to remember? I started thinking "Ken" might be a Spanish word, except I don't even think they use the K much normally. Or Randy Owens. Szczerbiak makes sense. Oddly when I found Michael Jordan reports, they call him "Jordan" far more than "Michael" or "Mike" which was common here.. It certainly makes these harder earned. Finding them is hard since they don't always use the word "puntos" but just a number. Almost impossible to research by just a number. Then if I find something I have to figure out who it is! There were many Phillips, or at least two, for instance. Are there other such newspaper sites for Spanish papers that you know of and I haven't found yet? ABC is not really user-friendly. There is also elpais.com, it features an archive although it is a more modern newspaper and only goes back to 1977 or so. So far I've found he was a 6-8 power forward who arrived from the "Atlanta franchise of the CBA". In 1987-88, there was only one Ken 'Kenny' Green in the CBA. Green played in 10 games for the Savannah franchise. Averaging 13.3 ppg, 7.2 rpg, 1.0 bpg, while shooting 70.0 % from the free throw line and 47.0 % from the field according to the 1988-89 CBA Register. The thing is, he joined the team in Mid-February. Which means, that he played somewhere else before. Also, in 1986-87, there was only one CBA franchise in Georgia: Savannah. But Green played that season for Rochester. Ken Perry, by the way, played also some games in the CBA.